During my web development, I usually need to run different terminal applications, like webpack, node server, etc. As Windows command prompt does not support tabs, I had to open multiple command prompts, which is very ineffective. This is not a problem for Mac / Linux users, as their consoles support programs like tmux. Fortunately, now Windows 10 allows you to run a Linux subsystem inside windows. Once enabled, one can install a Linux distribution such as Ubuntu and can run Linux command line programs inside Windows (with some limitation though). With this, I can split my terminals into multiple parts as below. Follow the steps to get this setup in Windows 10. Go to Settings -> Update & Security -> For Developers and enable Developer Mode. Click Yes in the alert box. Once you enable Developer Mode, now go to: Control Panel -> Programs -> Turn Windows features on or off. Search for Windows Subsystem for Linux and enable it. This will install necessary components in your system. You may have to restart your system. After you restart, go to Microsoft Store and search for Ubuntu. Install this app. Once Ubuntu is installed in your system, open it (just search for it in start menu). When it opens for the first time, it will download necessary files and will ask you to create a username and a password. This does not need to match your Windows password. Remember this username and password as this will be the root user and needed to install anything inside Ubuntu. Now you are inside Ubuntu land. You can run linux command line applications such as vi, git, apt-get, etc. Run sudo apt-get install tmux. This will install the terminal multiplexer application tmux. 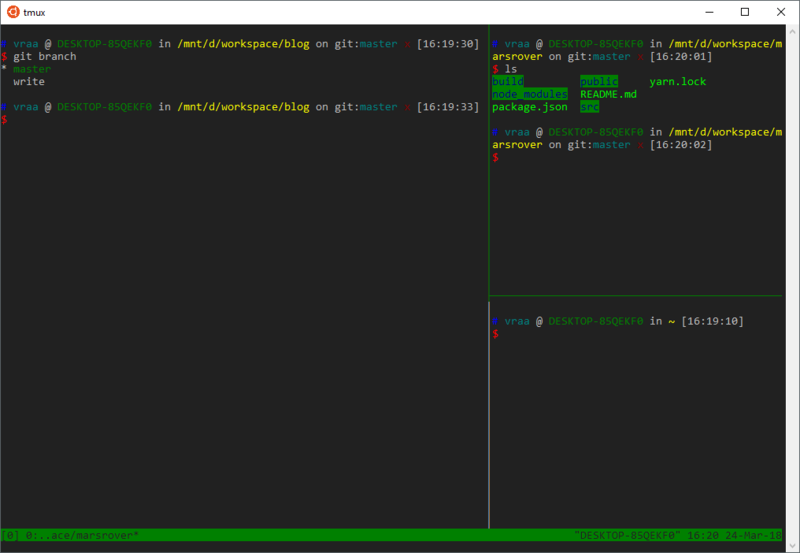 Once tmux installed, now run tmux. Now you can run any tmux command. For example, to split the terminal screen vertically, press Ctrl + b and %. And to split screen horizontally, press Ctrl + b and ". The default bash terminal is good. But it is not that good without ohmyzsh - a framework to install themes and plugins in your terminal. Let’s set this up. Inside Ubuntu terminal, run sudo apt-get install zsh. Once zsh is installed, switch to it by running zsh. Now go to http://ohmyz.sh/ and follow their instructions to install ohmyzsh. Once it is installed, just close and reopen the Ubuntu. When ohmyzsh installed, it would have setup zsh as your default terminal. My favorite ohmyzsh theme is ys. What’s yours?